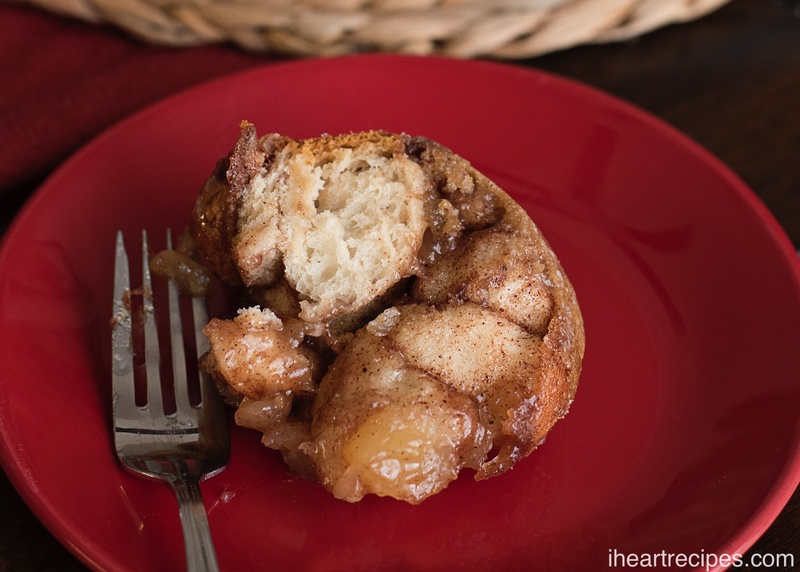 Easy Cinnamon Apple Monkey Bread made with biscuits, apple pie filling, and more. This is a quick & easy dessert that the whole family will enjoy! Anyone else out there love monkey breads as much as I do? 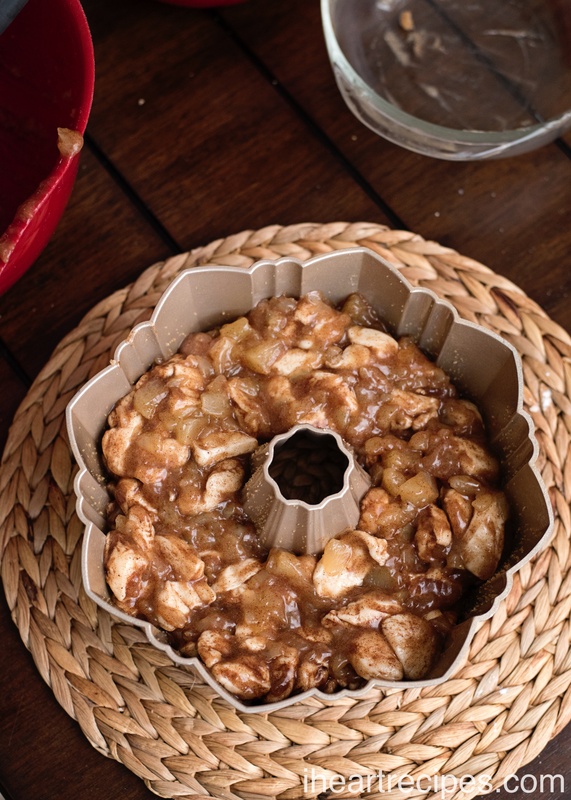 If so you’re going to LOVE this delicious cinnamon apple monkey bread! This ooey goey pull apart bread is delicious! It’s has a similar taste to my fresh apple cake recipe, but it’s a lot easier to make. Try making this easy cinnamon apple monkey bread, and leave me a comment below, especially if you have any more monkey bread recipe ideas that you’d like to see! Print the recipe below, and don’t forget to follow me on Facebook & Pinterest! 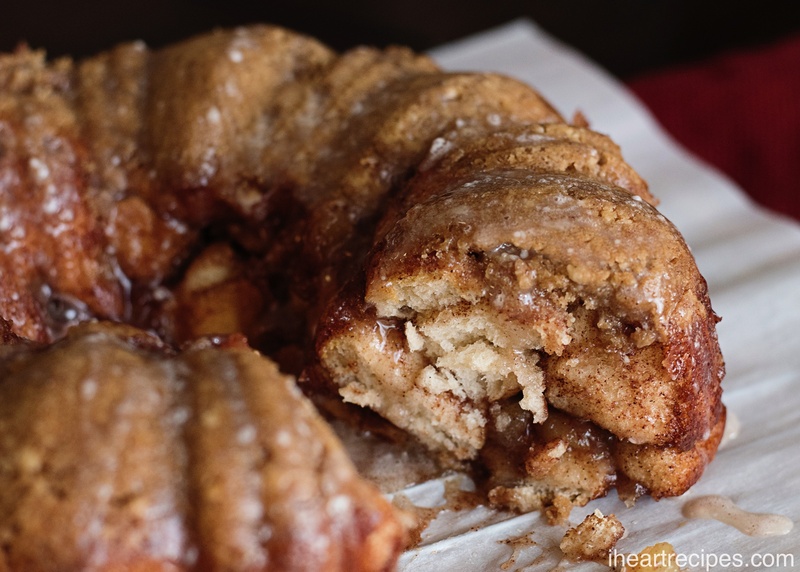 This delicious pull-apart monkey bread is made with biscuits, cinnamon, and a sweet apple pie filling. Serve for breakfast or as a dessert with ice cream! Pour the apple pie filling into a bowl and use a knife to dice the apples into small pieces. Add in the sugars, flour, cinnamon, salt, nutmeg, and butter into the apple pie filling mixture. Cut each biscuit into quarters, or smaller if you used the large biscuits. In a large bowl, mix together the apple mixture along with the biscuits. Generously spray a bundt pan, coating all sides, and pour the mixture into your pan. Bake for 45 minutes, until bread is all the way cooked through. Remove from oven and quickly turn your pan to remove your bread. Do this while it is still hot! You don’t want all of the gooey goodness to seep to the bottom of your pan. Now you can do the optional crumb topping! Mix together the crumb topping ingredients and sprinkle all over the top of your monkey bread. Stick it into the oven for another 5 minutes or so, just long enough to make it the topping crunchy. Top with the icing glaze drizzle. sense there are so many. Hi Ree. Any tube, or bundt pan will do. 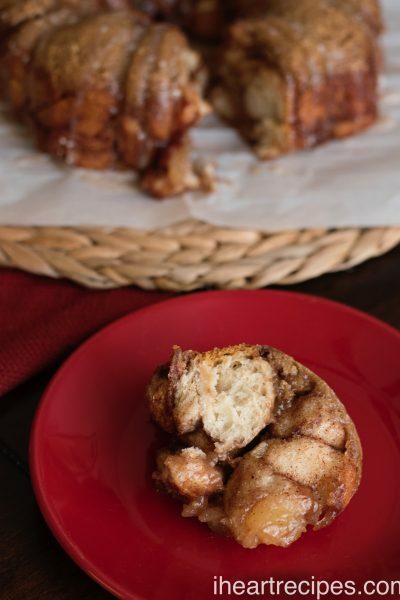 Would you happen to have a video for the Apple Cinnamon Monkey Bread? I love your Videos. I searched for a video but can’t find it. If not I can follow the regular recipe. Please let me know. Sorry. There isn’t a video for that recipe.